Taser C2 Black Leather Case with white stitching. 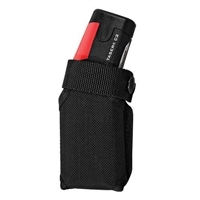 It has auto-eject capability making it fast to remove from the holster and has a belt clip to easily attach to your belt. For use with the C2 series TASER products only. Taser C2 black tactical holster. This lightweight yet durable holstering option for TASER C2 is the perfect choice for active lifestyles. It can be clipped to clothing, a belt, purse strap, backpack, or just about anywhere else. It is an ambidextrous holster. Keep your C2 secured yet easily accessible. Taser C2 replacement LPM. Replacement lithium power magazine replacement battery for the Taser C2 products only. Taser C2 Training Cartridges 2 and 4 Pack. The Blue training cartridges are 15ft range training or 'simulation' cartridges. They contain a primer, gas capsule, probes, non-serialized tags and non-conductive wires. The BLUE training cartridges fire like a live cartridge but do not have the ability to cause neuro-muscular incapacitation and should not be used for self-defense. The training cartridge will not cause the metallic target to 'crackle' and 'spark' in a demonstration. Compatible ONLY with the following products: TASER C2 series. Taser C2 Replacement Cartridges-Live 2 Pack. The Taser C2 replacement cartridges have a 15 foot range. They are black cartridges that contain a primer, gas capsule, probes, serialized tags and conductive wires.